So much for building on that big win over Wyoming. Four days after putting together its most impressive victory of the season, a 81-75 victory over the Cowboys, the UNLV Runnin’ Rebels delivered easily their worst performance of many seasons in a 77-59 loss to Boise State on Wednesday night at the Thomas & Mack Center. The Runnin’ Rebels (8-8, 1-2 Mountain West) fell behind 9-0 to start the game, trailed 31-9 after 11½ minutes and trailed by as many as 32 points early in the second half. Perhaps even more disheartening was the team’s lack of intensity, especially on the defensive end where Boise State (10-4, 3-0) looked like it was running layup drills at times. The Broncos had an astounding 28-6 edge in points in the paint en route to a 41-20 halftime lead. The loss dropped UNLV into a three-way tie for seventh place in the Mountain West with Wyoming and Utah State. HOW IT HAPPENED: Very quickly. Junior guard Chandler Hutchison sank a 3-pointer on Boise State’s first possession which was followed by a fast break layup by sophomore point guard Paris Austin and two more driving layups by Hutchison to give Boise State a 9-0 lead at the 17:26 mark of the first half. 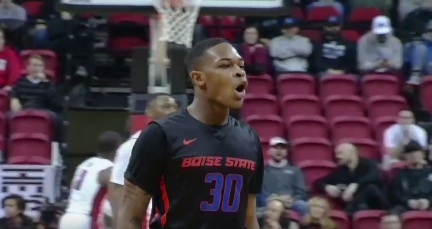 UNLV closed to 11-4 on a short Jalen Poyser baseline jumper before the Broncos broke the game open with a 20-5 run. WHO STOOD OUT: The lanky 6-foot-7 Hutchison looked like a future NBA guard, scoring a career-high 28 points and grabbing 11 rebounds to lead Boise State. He finished 12-of-19 from the floor, including 3-of-4 from 3-point range. Austin, who repeatedly beat Rebel defenders off the dribble, also had a big game for the Broncos, scoring 16 points to go with seven assists and six rebounds. Forward Tyrell Green and Poyser each scored 10 points to lead UNLV which shot 29.7 percent from the floor. Sophomore guard Kris Clyburn grabbed a game-high 13 rebounds for the second straight game but scored just four points on 1-of-11 shooting. “You can control how you play with effort. You can’t really control whether the ball is going to go in or not. We were rolling early.” – Boise State guard Chandler Hutchison to the Idaho Statesman. UP NEXT: UNLV begins a two-game road trip on Saturday afternoon at Utah State (7-7, 1-2), a 79-75 winner over New Mexico on Wednesday night in Logan. The 3 p.m. contest will be televised by CBS Sports Network. The Runnin’ Rebels then play at New Mexico on Tuesday night before returning to the Thomas & Mack on Jan. 17th to host San Diego State. NOTABLE: Boise State took over sole possession of first place in the Mountain West with the win. … The Broncos finished with a 42-22 edge in points in the paint. … UNLV was whistled for a season-low 11 fouls and finished with an 18-7 advantage in free throws made. The Rebels (29) attempted 20 more free throws than the Broncos (9). 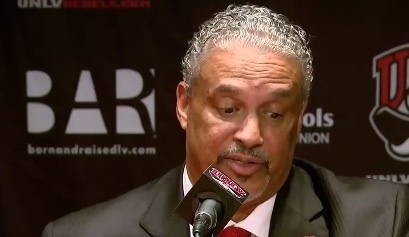 … UNLV has lost six of its last nine games by an average of 23.8 points per game. … Clyburn has grabbed 45 rebounds in the last four games.